Sharing weekly tips that will save you time, money or simply make life easier on your upcoming Walt Disney World vacation. Did you know that you don’t have to budget for the expense of renting a car when traveling to Walt Disney World Resort in Florida? 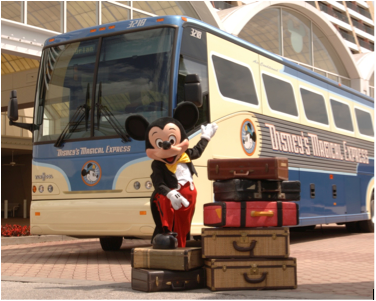 Disney’s Magical Express is a complimentary round-trip airport shuttle/baggage delivery service. This is available for guests booking vacations that include overnight accommodations at 22 Disney hotels at the Walt Disney World Resort. The service also includes expedited airline check-in process for return flights on participating airlines. Millions of guests of Walt Disney World Resort hotels have used Disney’s Magical Express since the innovative airport shuttle, luggage delivery and airline check-in service launched May 5, 2005. My family has used this convenient service multiple times. In October, 2004, prior to when the Magical Express was available, my husband and I traveled to Disney World with our 5 children. We knew that once on property, Disney provided complimentary transportation via buses, monorails and ferry boats to anywhere onsite that we wanted to go. This eliminated the need for a rental car. However, back then, we had to pay well over $125 for round-trip airport transfers. In addition, we had to deal with our luggage — which as you can imagine is quite a hassle when traveling with 7 people. I have nightmares recalling how difficult and exhausting it was with an infant, a toddler, a preschooler and 2 other kids. Since the introduction of the Magical Express, our Disney World vacations have become so much more convenient. The “Magic” begins before your plane leaves the ground to head to Disney World. You’ll be mailed yellow luggage tags to place on your bags prior to checking them at your hometown airport. You’ll then bypass the baggage claim at Orlando International Airport and board a state-of-the-art motor coach to Walt Disney World Resort. Like magic, your bags will be delivered directly to your resort room after check-in. The complimentary round-trip service between Orlando International Airport and Disney hotels is designed to give Disney hotel guests the stress-free vacation they want. Disney’s Magical Express service makes your return to Orlando International Airport hassle-free as well. This convenient system lets guests flying with participating airlines on domestic flights avoid airport check-in lines by enabling passengers to check their luggage and receive a boarding pass before departing their Disney hotel. Airline partners currently include AirTran Airways, Alaska Airlines, American Airlines, Continental Airlines, Delta Air Lines, JetBlue Airways, Southwest Airlines, United Airlines and US Airways. Guests with flight departures later in the day no longer have to worry about their luggage after they check out of their hotel. They can simply check their bags at the Resort Airline Check-in Desk and then enjoy the last day of their vacation. The Magical Express has simplified our vacations immensely. Once we check our bags at Boston’s Logan International Airport, we do not have to think about them again. We head out to the parks and our bags are waiting in our room when we get back at the end of the day. Heading home, the service is incredibly convenient as well. We check our bags and receive our boarding passes at our Disney resort, and pick up our luggage at baggage claim when we get home. Simply put, it’s Magical! Disney’s Magical Express must be booked at least 10 days prior to arrival through disneyworld.com, Disney Reservation Center by calling 407/W-DISNEY, or a travel agent. *Quick tip: Since luggage delivery can take up to 4 hours, you should bring a carry-on on bag with swimsuits, small tubes of sunscreen, diapers and anything else that you may need immediately. 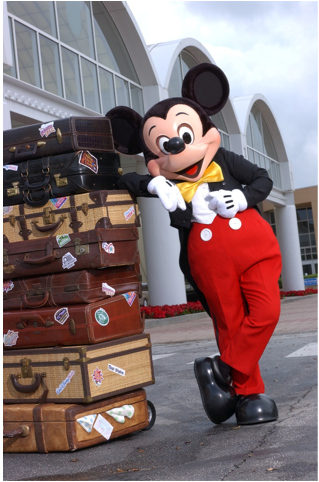 For more information, visit: http://disneyworld.disney.go.com/planning-guides/in-depth-advice/airport-service/. This entry was posted in Disney, Disney Travel Tip Tuesday, Disney World and tagged Disney transportation, Disney's Magical Express, Magical Express. Bookmark the permalink.